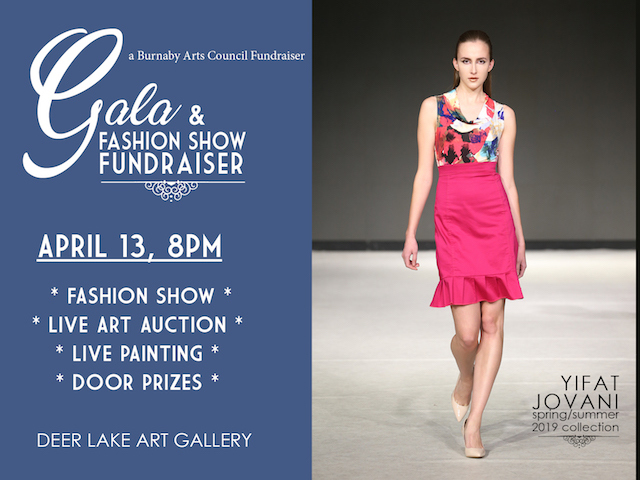 The Burnaby Arts Council proudly presents its Gala & Fashion Show Fundraiser on April 13th, which will include a Live Art Auction with a limited edition framed print by Susan Point, original artwork by Bill Higginson and local favourite ceramic artist Keith Rice-Jones and much more! Tickets: Tickets are available online now for just $35 and they include admission to the fashion show, art auction, live painting, silent auction, nibbles and a cash bar. Live auctioneer and emcee David C Jones will keep the evening flowing. Enjoy live music from Cumbia Galera, door prizes, and of course all the amazing art you can bid on and take home! 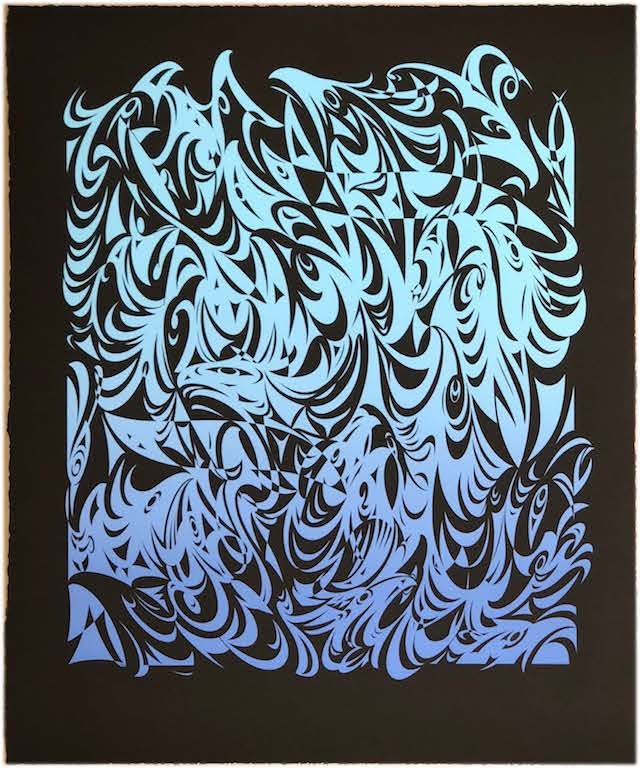 The event will also have live painting with February Park’s Edge winner – Jace Kim, whose piece, created on site, will be included in the live art auction. Jace Kim is a Canadian painter currently based in Vancouver, BC. He was born and raised in Korea where he was highly influenced by comic book art until the age of 15. He graduated Emily Carr University of Art and Design with a bachelor’s degree in Media art (animation) with the passion of animator. He worked in various game and motion graphic companies as a digital artist but he made a drastic transition to become a traditional painter. The event will also have a lovely 2019 spring/summer fashion design showcase featuring Yifat Jovani. Schooled in Miriam College in Tel Aviv, Yifat draws her inspiration from her years of travels, her love of nature, geometric shapes and from the beauty and strength of the women around her. As a mother of two, a designer, and a career woman, she recognizes the demands of the modern woman’s lifestyle. She believes women don’t have to suffer to look fabulous, and designs clothes that are easy to wear, easy to pair and easy to care for. It is this marriage between comfort and style that makes Yifat Jovani designs’ unique, and adds to their growing popularity and increased media attention. All creations are locally produced and manufactured in Vancouver. I have 2 pairs of tickets to give away to the Gala & Fashion Show Fundraiser! For almost 50 years the Burnaby Arts Council has fostered & promoted the Arts in our community. In 2020, they celebrate a year long explosion of dynamic programming filled with even more exciting events! Follow the Burnaby Arts Council on Facebook and Twitter and using the tag #BurnabyArtsConnected on social media. I will draw two contest winners at random from all entries at 12:00pm on Friday, March 29, 2019. UPDATE: The winner is Jenn! Twitted @drama_otaku! Would love to win! Fashion and Art…..would love to experience this show! I’d love to attend this event! Thanks! Yeah! Love fashion and would love to see a local designer showcasing made in Vancouver clothing! I would love to attend this fashion event! Art & fashion. Thank you for hosting this contest. Yay! Fashion is awesome! This is like Vancouver Fashion Week.